Powertex Tools Company Pvt. 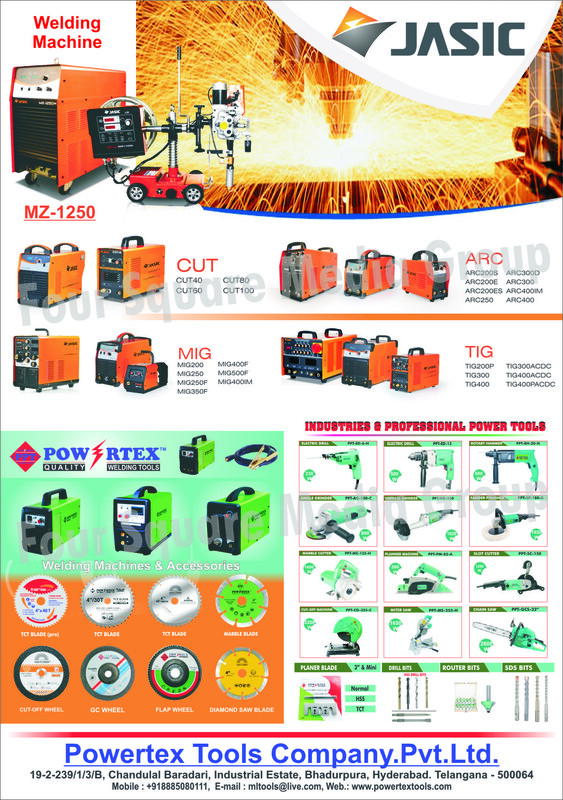 Ltd.
Welding Machines, Welding Machine Accessories, TCT Blades, Marble Blades, Cut Off Wheels, GC Wheels, Flap Wheels, Diamond Saw Blades, Industrial Power Tools, Professional Power Tools, Electric Drills, Rotary Hammers, Angle Grinders, Vertical Grinders, Sander Polishers, Marble Cutters, Planner Machines, Slot Cutters, Cut Off Machines, Miter Saws, Chain Saws, Planer Blades, Drill Bits, Router Bits, SDS Bits, Cut Welding Machines, MIG Welding Machines, ARC Welding Machines, TIG Welding Machines, Welding Accessories, Welding Tools as an active Manufacturer, Supplier, Dealer, Distributor, Trader and Seller etc. (*Importer/Exporter/Service Provider).